Shenzhen is one of the top cities in China for Halal food and Muslim tourists are spoilt for choice. Halal restaurants in Shenzhen offer Xinjiang, Turkish and Chinese Halal cuisine. 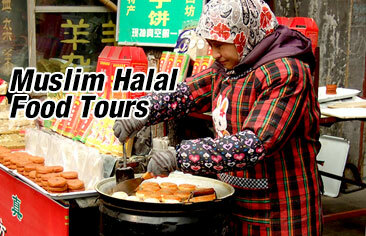 Below are just a few of the notable Halal restaurants in Shenzhen. The Shenzhen Muslim Hotel Restaurant is one of the longest running Halal restaurants in Shenzhen and serves genuine Muslim food. Famous dishes of the restaurant are roast whole lamb, lamb chops and spicy kebabs. Mesopotamia Muslim Halal Restaurant is a Turkish Halal restaurant located in Shenzhen’s Luohu District. The restaurant is praised as one of the best Turkish restaurants in Shenzhen and offers customers a range of delectable Turkish dishes. The must try dishes of the restaurant are Hummus, Cheese Pide, Adana Kebab and baklava. Zhong Fa Yuan Muslim Restaurant is a famous Halal restaurant chain which serves Xinjiang Halal Food. Popular dishes at Zhong Fa Yuan are mutton skewers, yoghurt, samsas, mutton chops and cold rice noodles. Jinjiang Xiyu Restaurant is a Halal restaurant in Shenzhen famous for its combination of traditional Halal cuisine which has combined traditional Arabic recipes with local Beijing cuisine. All ingredients used by the restaurant are freshly flown in from Xinjiang which means the dishes are authentic. Tarim River Restaurant is a Xinjiang restaurant that provides Muslim food. It is located in Futian District of Shenzhen city. The restaurant has a large scale and pleasant environment. It is decorated into the style of elegant, luxury and exotic of strong Xinjiang flavor. The main hall of the restaurant can hold a capacity of 400 people for dining at the same time.